While some bad moves have serious consequences, others are just downright silly, even if the point is to make a philosophical statement about religion. You certainly won’t be thrown in the slammer for wearing a spaghetti strainer on your head, but you may not be allowed to get a driver’s license. It will hinge on your state and its stance on the Church of the Flying Spaghetti Monster and its members, who are known as Pastafarians. Some find the church to be a spoof, but its members say it’s not. Many states’ DMVs turn down such requests, but in November 2015 the Registry of Motor Vehicles in Massachusetts allowed a woman to wear a colander on her head for her license photo. An attorney associated with the American Humanist Association helped her fight the right to wear her headpiece in her photo after first being denied since the RMV bans hats unless it is for medical or religious purposes. Her stance was that the right to wear religious headgear should extend to those who follow the Church of the Flying Spaghetti Monster as much as any other religion. Someone who didn’t make the approved list is a 21-year-old college student in Chicago. In the summer of 2016, she persuaded DMV employees to take her driver’s license photo, but then received a letter from the Illinois secretary of state’s office saying her license would be canceled unless she had a new picture taken. Here the state has gone through this issue before and has the official stance that the metal headgear is satirical and not religious. A senior legal advisor for the state said that wearing the headgear was a form of free speech, but so is giving the finger, which also isn’t allowed for a driver’s license photo. 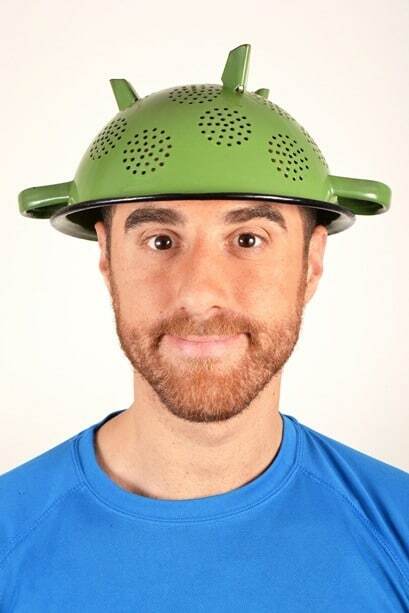 0 Responses to "Wearing a colander on your head for your driver’s license photo"